This is what it's all about. 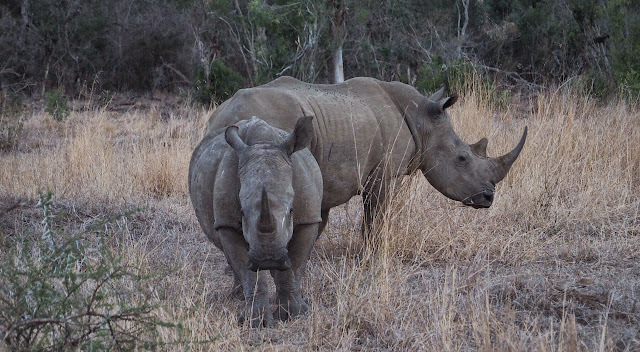 Imposing, independent, ageless: white rhino in the national park surrounding our campsite conference at Imfelozi in KZN, South Africa. There are 300 people here from countries as far apart as New Zealand, England, Sweden, the US and Vietnam, half of them students aged around 17. For two intense days they're here to hear inspiring speeches, learn about the war against poaching, its causes and effects, and to come up with ideas to help the cause. "Let our voices be heard" is the slogan, and the aim is that these kids will go home fired up and impassioned to use every means at their disposal to save the rhino from the extinction that is looming. One day in, it's looking good. The kids are serious, aware of the responsibility - but having fun, too. Until you've sat by a campfire under a black African sky and watched young Zulu dancers stamping and jumping with astonishing energy, whistling, singing and ululating, you really haven't lived.